Take time tomorrow to celebrate the history of faith in Cheyenne! How exciting to see that the organizers of the 150th celebrations in Cheyenne included the history of faith in our community and had the vision to bring us together on August 6 at 10 am in the Civic Center! All of us at RE/MAX Capitol Properties are pleased to have the opportunity to support the 150th events as a sponsor. 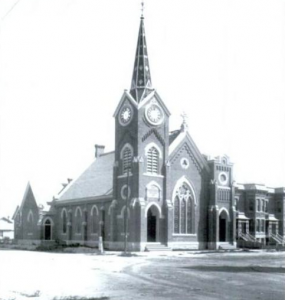 Here’s a brief history of three of the main downtown original churches in Cheyenne; First Presbyterian Church (our family’s church), First United Methodist Church and St Mark’s Episcopal Church. It was a treat to look these churches up to learn when each one started and a little bit of each one’s history. I was surprised to read that St Mary’s wasn’t founded until 1907. Each church adds its own character to the current downtown area and a place for many of Cheyenne’s residents to worship. First Presbyterian Church was organized in the Territory of Wyoming on July 18, 1869. The current building at 22nd and Carey was dedicated on March 22, 1925. There have been two additions to the building; a memorial chapel in honor of the Presbyterian young men who lost their lives in World War II was dedicated on November 10, 1948 and a new CE wing in September 1961. Today you’ll hear the church bells ringing if you are downtown. It’s a joyful sound! The first service for First United Methodist Church in Cheyenne was held on September 29, 1867 by Reverend W. W. Baldwin in City Hall. In 1869 the church bought two lots from the Union Pacific for $1.00. The church was dedicated by Bishop Ames on September 23, 1871. The current church began construction in 1890. It was dedicated on Easter Sunday, 1894. Today the church has many programs that offer a hand to the community. Two that I have enjoyed are the Kids Day Out Program and the Pumpkin Patch. St. Mark’s Episcopal Church has a long history in Cheyenne dating back to 1868. The current church held its first service on August 19, 1888. If you get a chance to go today take notice of the interior, which was made to resemble an upside down ark with a marble floor. It is a gorgeous piece of architecture.